This first image of my curiosity journal, is called “Still Life with Fruit on a Stone Ledge”, made by Caravaggio (1571–1610). I have always loved renaissance art, perhaps because of my Roman heritage. Growing up my education has often revolved around the time of prosperity of my country, especially renaissance. 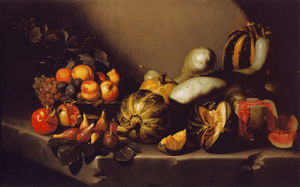 During this golden era for Italy, the artists were the protagonists of the scene, and becoming one was the result of various years of academic training, which involved, among different techniques, mastering the art of still life representations. One of the major exponents was for sure Caravaggio, that with his revolutionary techniques has changed the way of representing light. My second image is a representation of a portrait of pope Innocenzo X, made by Goya (1650). Im really close to this pictorial work for two major reasons; the first one is that it is the most important picture of the famous art gallery “Doria Pamphilj” in Rome. I am really attached to this place since was the first “museum” that I have ever visited, and all the frescoes and paintings that were displayed in the gallery made me rethink the glorious moment that my city had during the Renaissance period. The second reason is connected with the theme of the corruption inside the Vatican. Since I have grown up in catholic household, and sent to a school run by priests until the age of sixteen, these reasons combined with the fact that overall Italy is considered an extremely religious country, is what pushed me to question this sacred institution that has persisted for all these years.The corruption has always been part of the church, but it became more obvious in the historical context during the crusades. From the XI to the XIII century, the church has sent armies and armies to battle with the excuse of fighting ‘for their God’s will’ while exterminating populations and conquering more territory for the papal state.At the same time, the church was also looking to increase their wealth, which they did by selling indulgences, meaning that they would ‘absolve’ observants of all their sins in exchange for money, that they would later use to enrich their own wealth instead of helping the less fortunate. My first group of pictures, instead, represents the ingredients necessaries to create a perfect “Italian frittata”. This group of photos are; tomatoes “Pachino” (number 1), green beans (number 3), extra virgin olive oil (number 2), chicken egg (number 20), salt (number 5) and to finish zucchini “romanesche” (number 8). This group of ingredients were the same ones that my grandmother used to use to make the traditional “Italian frittata”.Growing up in Rome, I have always had two constant passions in my life: food and fashion (explained in the next point). These were deeply influenced by my Italian heritage, as Italy has always been known for its culinary excellence and its great style in the fashion industry. As a child, I always wanted to become a chef in an Italian restaurant, so from this dream in the drawer I always wanted to learn how to cook traditional Italian dishes. My major teachers were basically two: my grandmother and my mother; but was the first one to make me passionate about this wonderful culinary world. She started teaching me how to make handmade pasta from scratch, up to teach me complex dishes that require patience and a lot of expertise. But the first thing I relate with food is the ‘frittata’ that my grandmother used to cook for me when I was a child. From these fond memories, I have taken inspiration for my curiosity journal, by collecting images of the food she would use to make me ‘frittata’. Ever since I was a child I have always been interested in the process of creating clothes that people would wear. I found fascinating how I could design something, make it into a practical thing and then use it for myself or see other people use it on a daily basis. Fashion was not my initial passion, it started off from observing and studying the design of cars and industrial objects. I enjoyed the process of developing an original structure with a purpose. This broad me to attend in my own time design classes to learn how to improve my drawing skills. From the knowledge I gained, I started developing an interest for fashion itself. Once I started sharing my interest for design to my family, my grandmother took me under her wing to teach me the basic of the fashion industry as she worked for Gucci. In Rome, is not really common for guys to have an interest in fashion, following the stereotypical way of thinking that fashion is for girls. During the years, I started developing my own way of seen fashion, being deeply influenced from my pragmatic knowledge of object design. Where as many people find clothes as the primary focus, I decided to put all of my effort on shoes, at detail which is often disregarded as secondary, but not in my eyes. football in my country is like a religion. I grew up watching football matches every Sunday with my brother and my father. It was and still is, a point of connection with anyone of my nationality, even if I don’t know someone, I know that we share the same love for football. The entire country I decided yet unified by this sport, since there are so many clubs often even two per city, meaning that although every Italian has roots for different clubs, once it comes to the World Cup we all come together to root for Italy. I played ever since I was a kid in a football club, I also played tennis, but it didn’t involved me as much as football. During my football sessions I also met my best friend Rodolfo, this being an example of how football connects people with different interests who would not have been in each other lives otherwise. Wanting to connect two of my passions brought me to start designing my own version of different club uniforms. hunting has been tradition of my family ever since I can remember. My memories feature a lot of afternoons spent with my grandfather before, and uncle after, in a forest learning how to hunt the fauna fo the place. Both of my grand grandfathers were rewarded with medals during the second world war, so the tradition of learning how to shoot has been passed on generation to generation. Despite growing up surrounded by this thinking, I started to develop the opposite opinion as my relatives on the topic of hunting. This my decision was supported by my mother as she is an animal activist and spends her time rescuing dogs. To this day I have to deal with this inner conflict as on one side I have my uncle bringing me hunting and on the other one my mother asking me not to go. If I have to follow my morals principles I would not go, but I can’t disrupt years and years of family traditions. In the future I hope, I will be able to discontinue this tradition in a way not dishonor my family but at the same time following my principles and teaching my children that there is no need to kill animals in order to feel close to their relatives. As mentioned before, one of biggest passions is car design. It all started when I was nine, for a reason I can’t remember, I started measuring cars. I would spend my days measuring each element of the structure of the car, in order to try to recreating afterwords while sketching in my house. This interest broad me to spend most of my time studying the various kinds of car design. I remember spending entire afternoons looking out from my bathroom window observing the cars going by while filling empty sheets of paper with as many car plates as I could. During my in-depth study of car design I started to develop a preference for the style created by Audi. This led me to travel around Europe, in particular Germany, where I visited the the main factory fo Audi, Mercedes Benz and BMW. From these trips I started collecting scale models of cars, that I still have now on my shelves. Wanting to create my own car, I started getting lessons of how to use Rhino 3D (a 3D editing software). In six months I finished the rendered prototype of my first car, called “one”, since I am very creative. As time went by I have replaced car design with fashion design.